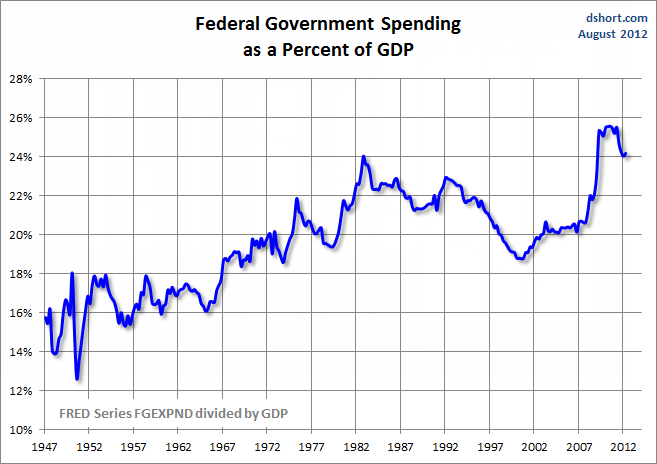 Here are a couple of charts from Doug Short at Advisor Perspectives regarding government spending. I asked Doug for those charts because Paul Krugman said he would be concerned if government spending hit 50% of GDP. The trend does not look good, but by Krugman’s measure there is a ways to go. Nonetheless, I think we should be concerned now. The numbers ignore exploding national debt and interest on national debt. Interest on national debt will skyrocket if rates go up or growth estimates penciled in do not occur. Both of those are likely, although Japan proves that amazingly low interest rates can last longer than anyone thinks. The figures also ignore ever-escalating costs of Medicare, Social Security, and pension promises, all of which are guaranteed to soar in the not so distant future. Romney says Unfunded liabilities amount to $520,000 per household. I will point out that those liabilities are not debt yet. So might Krugman. However, I am comfortable in reducing benefits and slashing spending while Krugman is not. 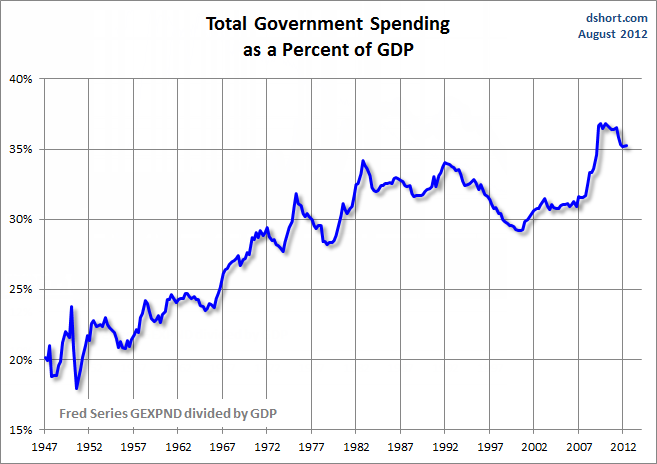 Clearly there are many ways to spin this data but please note that government spending in France exceeds 50% of GDP. Also note that French unemployment is 10.2% and Hollande is poised to hike the top marginal tax rate to 75%. Do we really want to imitate France?